World War I was a multi-front war with fighting occurring on the Western Front, Eastern Front and other fronts in and around Europe. While the European powers battled it out in France and Russia, another major battle took place south of the Balkans. 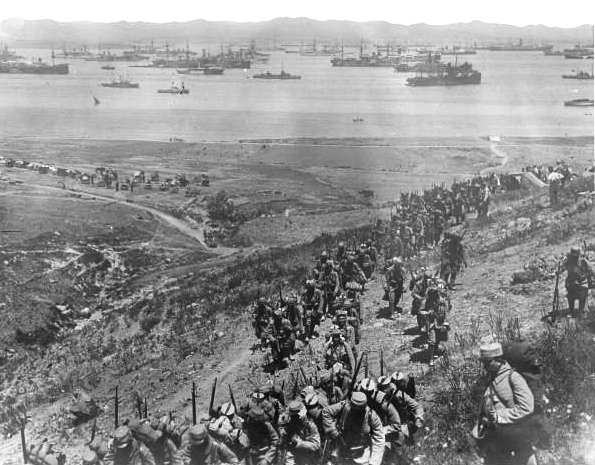 In 1915, the Gallipoli Campaign (sometimes called the Dardanelles Campaign) took place, in which the British hoped to capture control over the strait between the Black Sea and the Mediterranean Sea. The strait was a vital shipping route and the British hoped that by capturing the region they could help liberate the Balkans from the control of the Central Powers and help Russia in its battle on the Eastern Front. The Gallipoli Peninsula and the strait were controlled by the Ottoman Empire, which was allied with the Central Powers during World War I. The leadership of the Ottoman Empire oversaw a vast empire that stretched across much of the Middle East. British forces landed on the Gallipoli Peninsula on April 25th of 1915 and would abandon their positions by December of that year. The entire campaign was a massive failure for the British as their troops struggled against the Turkish forces of the Ottoman Empire. In total the British suffered over 250,000 casualties in the battle, and is viewed as a major loss for the Allied side of World War I.